Thank you so much for inviting me to speak at your conference. I would love to make this happen if it’s possible! I like speaking at conferences: I like meeting new people and re-connecting with old friends, and I especially enjoy meeting with organizers of local community groups. And, of course, I like selling books.  I’m happy to speak at local conferences, regional conferences, national and international conferences. My honorarium is low, and my travel requirements are pretty minimal. If I can fit this event into my schedule, I’d love to do it. If your speaker lineup is overwhelmingly white, I am not willing to speak at your conference. If you send me a confirmation with a list of scheduled speakers, and that list is overwhelmingly white, I will withdraw from your conference. I’m sorry to come across like a hardass. But experience has taught me that I have to be. Experience has taught me that if I don’t say something ahead of time, I will often wind up on an overwhelmingly white speaker lineup. 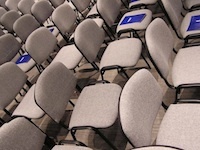 Not always — a lot of conference organizers already get this, and are on it — but often. Experience has taught me that, even if I do say something ahead of time, I will still sometimes wind up on an overwhelmingly white speaker lineup. We will then have to have an awkward conversation, where I explain that I’m withdrawing from the conference and why. Here is a list of prominent atheists of color, and organizations of atheists of color. Many of them are excellent speakers, as are many of the organization leaders. Many of them, like me, have low honoraria and minimal travel requirements. If you book me for your conference, and you then put together an overwhelmingly white speaker lineup, you will have an open slot in your schedule. Please consider filling it with one of these people. Better yet: Please look at this list before you start putting together your speaker lineup, so you have a diverse lineup to begin with. I understand that event organizing is very difficult, and conference organizing is especially difficult. I understand that it’s hard to co-ordinate schedules, balance content, and arrange for travel and honoraria that will fit your budget. So here’s a tip: When you’re putting together a speaker lineup, START with diversity. START by inviting African-Americans, Latinos, women, disabled people, transgender people, people of Asian descent, people of Middle Eastern descent, other people of color, lesbian and gay and bisexual people, people who have left religions other than Christianity. Don’t just invite the usual suspects, fill up three-quarters of your lineup — and then go, “Crap! Diversity!” and scramble to fill in the last two or three open slots with people who aren’t white, middle-class, college-educated, cisgender, straight, able-bodied, ex-Christian or lifelong-atheist men. Again, I’m sorry to be a hardass. Generally speaking, I’m an easy speaker to work with: again, my honorarium is low, my travel requirements are pretty minimal, and I try to be as flexible as possible. But this is an extremely high priority for me. In my opinion, this issue — making our communities more welcoming and more supportive of a wider variety of people than are currently participating — is the most important issue currently facing organized atheism in the United States. Diverse speaker lineups at conferences isn’t the only thing we need to do to address this issue, of course, or even the most important thing. Very, very far from it. But it’s one of the things I can do something about. So I’m doing it. Thanks for understanding. Hope we can make this work! P.S. This also applies to harassment policies/ codes of conduct. I won’t speak at a conference that doesn’t have one. That’s been less of an issue lately, though — almost all atheist and skeptic conferences have them now — so I didn’t feel a need to write a whole thing about it. Note: Yes, this is in reference to a specific event — and no, I’m not going to tell you which one. It was a private conversation, and I’m going to respect that. Ingrid and I are watching the entire Steven Universe series for the third time, and since we’ve been spending so much talking about it the first two times, I thought I’d blog some of my observations about it. 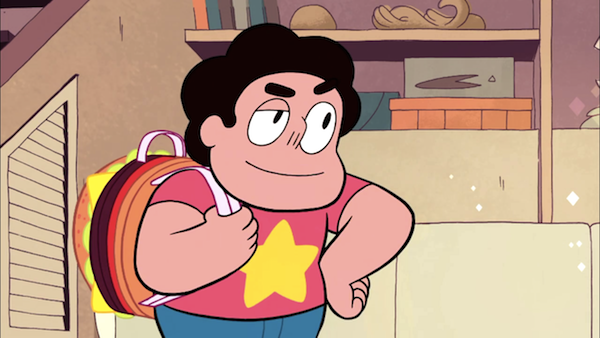 Please note: I’m not writing these Steven Universe posts as a series summary or recap. I’m just writing down some of my observations and reactions (not necessarily coherently), both to the show as a whole and to the individual episodes. These posts will probably make more sense to people who are already watching/ have already watched the show, but I hope they inspire the rest of you to check out the show, as it really is one of the richest and most emotionally intense things I’ve seen on TV. 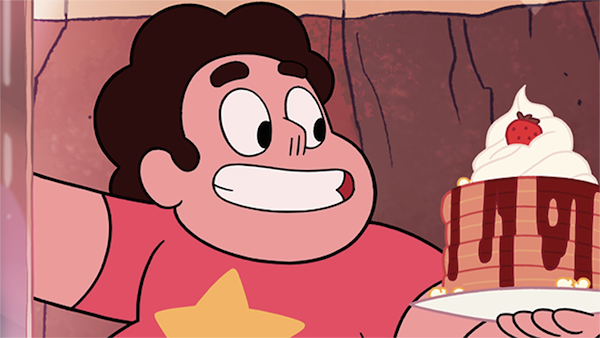 Note: This post may contain spoilers about Steven Universe: the show as a whole, and/or about Episode 4: Together Breakfast. This episode really hits home for me. Steven wants the Gems to have a nice breakfast together — not just any nice breakfast, but the specific nice breakfast that he made for them. And he wants them to have it right away. “I can’t let this become together brunch!” He’s so attached to this that he doesn’t pay attention to the fact that this particular moment is not a good one: the Gems are distracted and have other things to take care of. As a result, the breakfast gets transformed into a hideous monster that he has to destroy. At age 53, I’m still learning this. I totally get it about having a vision of a particular form of togetherness — a special dinner, a party, even just a quiet evening at home — and being so invested in it turning out exactly the way I want it to, I get stressed and miserable and horrible to be around. When I catch myself doing this in the future — when I catch myself prioritizing a particular form of connection and togetherness over the actual connection itself — I am going to try to remember the image of the breakfast monster trying to destroy everything. This is the first episode (I think) where we see Amethyst in a male persona. Ingrid commentary: The opening sequence, where Steven is making the breakfast, totally reminds her of Ren & Stimpy. The animation, the music — everything. Ingrid and I are watching the entire Steven Universe series for the third time, and since we’ve been spending so much talking about it the first two times, I thought I’d blog some of my observations about it. Please note: I’m not writing these Steven Universe posts as a series summary or recap. I’m just writing down some of my observations and reactions (not necessarily coherently), both to the show as a whole and to the individual episodes. These posts will probably make more sense to people who are already watching/ have already watched the show, but I hope they inspire the rest of you to check out the show, as it really is one of the richest and most emotionally intense things I’ve seen on TV. Note: This post may contain spoilers about Steven Universe: the show as a whole, and/or about Episode 3: Cheeseburger Backback. “Everything’s a pocket! Even the cheese is a pocket!” I have totally bought purses for this exact reason. This episode begins to touch on a theme that comes up over and over again throughout the show: a particular paradox of relationships between adults and children. On the one hand: Adults really do know more than children, and generally have better judgment. On the other hand: Children are people, with ideas and observations of their own — and sometimes, they come up with ideas and make observations that adults miss. So when kids have ideas that adults think are ridiculous, or see things that adults don’t see — when should adults take children’s contributions seriously, and when should they say, “We’re the adults, we know better, and we’re going to make the decisions, based on our own knowledge and judgment”? In this episode, the gems make both mistakes. They don’t trust Steven to have good ideas that will contribute to the mission (at least, not at first). At the same time, they let Steven have too much responsibility — they let him be responsible for the moon goddess statue, the single most important element of the mission. It’s a difficult balance to get right, and no adult is ever going to get it perfect, or even close to perfect. I love Mr. Queasy. The Steven-verse has the weirdest kids’ stuff. The Mr. Queasy toy; the Crying Breakfast Friends TV show… it’s weird and inexplicable, in exactly the way that kids’ stuff is often weird and inexplicable. I love Pearl fretting about the water damage to the Lunar Sea Spire. “I just want everyone to know — my plan would have also worked.” Pearl is so — Pearl. Over-achieving and competitive, even with a small child. Again — a theme that comes up again later in the show, in more serious ways. Ingrid also is noticing how young Steven’s voice is in this episode, compared to later episodes. He really does grow and mature as the show progresses. I don’t often go to conferences if I’m not speaking at them. I’d like to, I just can’t afford it. I did, however, pay my own way to go to Skepticon this year. And I’m going to the Secular Social Justice Conference. I heard AMAZING things about last year’s predecessor, Moving Social Justice. I wasn’t able to go — I had a previous commitment — but everyone I talked to who did go said it was extraordinary and life-changing. So I am absolutely not going to miss it this year. Last year’s Moving Social Justice conference featured an incredible array of activists, organizers and educators from the secular and social justice communities. Building on that momentum, the 2016 Secular Social Justice conference will be held January 30 and 31st at Rice University in Houston, Texas. The conference will address the lived experiences, cultural context, shared struggle and social history of secular humanist people of color and their allies. It will focus on topics such as economic justice, women of color beyond faith, LGBTQ atheists of color, African American Humanist traditions in hip hop, racial politics and the New Atheism and more. Speakers include Sikivu Hutchinson, Anthony Pinn, Soraya Chemaly, Heina Dadabhoy, Debbie Goddard, Sincere T. Kirabo, Alix Jules, Donald Wright, Monica Miller, Frank Anderson, Maggie Ardiente, Georgina Capetillo, Daniel Myatt, Juhem Navarro-Rivera, and Secular Sistahs, with more speakers (I believe) still to be announced. And it’s cheap: $40, and $25 for students. January 30 and 31 in Houston (here’s info on courtesy hotel rates). Hope to see you there! Ingrid and I are watching the entire Steven Universe series for the third time, and since we’ve been spending so much talking about it the first two times, I thought I’d blog some of my observations about it. Please note: I’m not writing these Steven Universe posts as a series summary or recap. I’m just writing down some of my observations and reactions (not necessarily coherently), both to the show as a whole and to the individual episodes. These posts will probably make more sense to people who are already watching/ have already watched the show, but I hope they inspire the rest of you to check out the show, as it really is one of the richest and most emotionally intense things I’ve seen on TV. Note: This post may contain spoilers about Steven Universe: the show as a whole, and/or about Episode 2: Laser Light Cannon. The BITS! The BITS! The BITS! The BITS! Ingrid commentary: Ingrid, who has been reading more S.U. commentary than I have, says it’s been pointed out that the laser light cannons are very weirdly sexual, both phallic and vulval. Ingrid asks: What the heck is the Red Eye thing, anyway? She points out that at this stage of the show, they’re not really explaining what the things are that they’re battling, or how they fit into the larger narrative. She also points out that, having watched the entire show already (twice! ), it’s weird to be seeing these early episodes with so much exposition and explaining. Ingrid and I are watching the entire Steven Universe series for the third time, and since we’ve been spending so much talking about it the first two times, I thought I’d blog some of my observations about it. Please note: I’m not writing these Steven Universe posts as a series summary or recap. I’m just writing down some of my observations and reactions (not necessarily coherently), both to the show as a whole and to the individual episodes. These posts will probably make more sense to people who are already watching/ have already watched the show, but I hope they inspire the rest of you to check out the show, as it really is one of the richest and most emotionally intense things I’ve seen on TV. 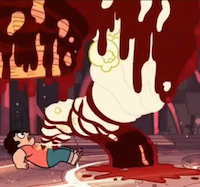 Note: This post may contain spoilers about Steven Universe: the show as a whole, and/or about Episode 1: Gem Glow. I once read an essay about Buffy the Vampire Slayer (I promise this isn’t a tangent, it really is relevant) that talked about how, in stories about interactions between ordinary people and space aliens or supernatural beings, there are more or less two arcs the stories typically take. The story is either about (a) humans exploring the alien/ supernatural world, or about (b) aliens/ supernatural beings exploring (or invading) the human world. The essay argued that the (b) storyline is almost always the same — shock, disbelief, being forced to accept the reality, often with the aliens/ supernatural beings trying to conceal their non-humanness at first — and as a result, it’s almost always boring. It argued that one of Buffy’s strong points is the main civilian characters go through this (b) arc very, very quickly: for Xander, for instance, it happens in one word, after he overhears a conversation between Buffy and Giles and says to himself, “Vampires?” So while in the most literal sense the show is a (b) arc, it’s about adventure and exploration as much as it’s about shock and defense. Here’s why I bring this up. One of my favorite things about Steven Universe is the fact that, for the townspeople of Beach City, the (b) storyline is already in the past. The ordinary people have already accepted the existence of the Gems. It’s not clear how long ago this happened, whether it was just a few years ago (maybe shortly after Steven was born?) or whether, in this universe, people have always known about the Gems. But Lars at the donut shop makes a passing reference to Steven’s “magic belly button” in the first minute and a half of the first episode. It’s clear right away that this show is not about the Gems trying to keep their alien-ness from the townspeople. Everyone already knows, and while it’s a bit weird and sometimes scary, it’s not surprising, and really not that big a deal anymore. This makes much more room for more complicated, nuanced, interesting interactions between the townspeople and the gems, and a more complicated, nuanced, interesting exploration of ordinary people’s experiences of the unusual, and unusual people’s experiences of the unusual ordinary. Steven’s obsession with Cookie Cats really captures how children’s priorities are so different from adults’. The Gems are battling dangerous, gross centipeetle things, and he cares about that — but he’s so easily distracted by the freezer full of Cookie Cat ice cream treats. I like how the advice from all three Gems about Steven using his power is all contradictory — and yet, it’s all useful and accurate. I like how Steven is learning that inspiration and skill can’t necessarily be channeled by re-creating the circumstances of the last time he got inspired. Heck, I’m still learning that. I love how the Cookie Cat back-story parallels the Gems’ backstory. I love how Lion Lickers become a thing later (Lion! ), even though Steven is angry about them now. It’s fascinating watching the early episodes again, and seeing how young Steven is. It makes me realize that, among the many ways this show is honest and accurate about childhood (and especially about children’s shifting understanding of adults), it’s accurate about Steven become more mature as the show progresses. Ingrid commentary: Ingrid is not okay with the fact that Steven doesn’t go to school. Yes, of course he needs to learn about how to be a Gem — but doesn’t he also need to learn human stuff? She’s also noticing that in this first episode, Pearl has the strongest personality. Garnet and Amethyst take time for their characters to develop. I was invited to participate in the project (here’s a collection of all the letters). Here’s what I wrote. I wish I knew how this turned out for you. Are you living in a reasonably healthy world? I don’t imagine you’re in a Utopia: I know human nature too well. But are you okay? Is there enough water, food, power, medicine? Is your daily life manageable, even joyful? Or is it too hot, too dry, to sustain human life in any tolerable way? Is the world overrun with famines, mass migrations, epidemics, wars? Does my beautiful city of San Francisco even exist, or have the waters risen and drowned it? Are you not even reading this letter, because the world has disintegrated so badly that “reading letters from the past on the Internet” is not a priority, or even an option? Did we fix this in time? I think about social change activists of my day, and I often wonder if we’re all fools. If we don’t fix global warming, every other fight we’re fighting — for fair housing and voting rights, against misogyny and racism and plutocracy — will be a moot point. If we don’t fix global warming, now, today — game over. I know that’s not fair. I know we all need to do the work that inspires us. And I know all these struggles are connected. Part of the reason I work so hard for a more rational, evidence-based world is that I want more people to acknowledge that global warming is real, and to take it seriously. But I often wonder if all of us — not just all activists, but all humans — are foolish beyond description to work on anything but global warming, with every scrap of power we have. I’m an atheist and a humanist, and I have no notion that there’s another life, another world, where everything will be okay. I accept that this life is our only one, this planet the only home we have. If we don’t fix global warming, it’s game over. And I love this game. I love life. As terrible as it can be, as much as it’s filled with suffering and brutality, I love life, and humanity, and the world. So I’m working to get this right. I’m persuading as many people as I can to get this right. I hope we fixed this. I love you. I hope you’re okay. Keyshia Blige. March 7th, 2015. Cause of death: shooting. Tamara Dominguez. August 15th, 2015. Cause of death: repeatedly run over by vehicle. Kandis Capri. August 11th, 2015. Cause of death: shooting. Amber Monroe. August 8th, 2015. Cause of death: shooting. Ashton O’Hara. July 14th, 2015. Cause of death: stabbed to death, run over by vehicle. Shade Schuler. July 29th, 2015. Cause of death: unknown, found dead in a field. K.C. Haggard. July 24th, 2015. Cause of death: multiple stab wounds. India Clarke. July 21st, 2015. Cause of death: gunshot to the head and arm. Mercedes Williamson. May 30th, 2015. Cause of death: beaten to death. Penny Proud. February 10th, 2015. Cause of death: shooting. Taja Gabrielle DeJesus. Feburary 8th, 2015. Cause of death: multiple stab wounds. Diosvany Muñoz Robaina. April 26th, 2015. Cause of death: stoning. And so many more. Far, far too many more. Every one of these people had selves, consciousness, lives that mattered to them as much as yours does to you. Remember. Listen. Learn. Speak. Act.